Her tail wags. Her eyes shine. She moves like a typical adolescent dog, all clumsy legs and a nose that doesn’t stop sniffing. The only thing unusual about her is her bandaged head. As with all the dogs that wind up in the shelter, the details of Maggie’s past are sketchy at best. My guess is she was attacked–perhaps viciously–by another dog. 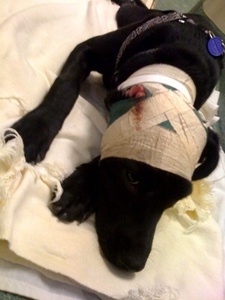 Her injuries were serious enough to warrant a trip to the animal hospital; when she arrived here, it was clear her head had been professionally bandaged. But why her owners, or whoever had paid for her treatment, hadn’t kept her is anyone’s guess. Canine resilience amazes me. Despite her injuries, despite being left in an unfamiliar place, Maggie seems at ease. She licks my hand and thumps her tail and scoots closer as I stroke her back. She arrived today, so tonight will be her first in the shelter. 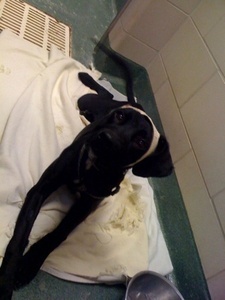 She appears at home on the blankets in her kennel, drowsy after our lively meet-and-greet. I hope she sleeps well.